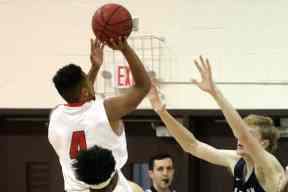 January 9: Chris Miner, Ben Crawford and Dom DeRegis all netted double-digits but the St. Lawrence University men's basketball team fell to Liberty League rival, Clarkson 86-58 on Tuesday evening in Potsdam, New York. Miner led the Saints with 15 points and six rebounds, while Crawford posted his fourth double-double of the season with 11 points and 10 rebounds. 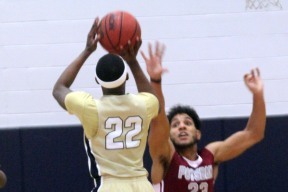 DeRegis also scored 11 points and added five rebounds and one steal. Both teams got off to a quick and even start, but it wasn't long before the Golden Knights started to run away with the lead. Joe Lucas finished a seven-point run for Clarkson with a jumper from outside the paint, giving the Golden Knights a 12-5 advantage. Gary Hanley extended Clarkson's lead to 11 points going 2-for-2 from the free throw line. The Golden Knights continued to pull away and amassed a 44-28 lead at halftime. Despite multiple comeback attempts from the Saints, they were unable to hold off Clarksons' high-scoring offense. The Golden Knights shot 46 percent from the field and 50 percent from the arc, landing nine 3-pointers for 42 points in the second half. 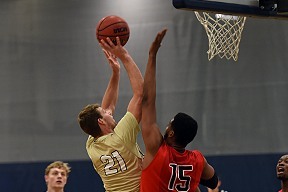 Matt Higgins led the Golden Knights to their first Liberty League win with 21 points, four rebounds and two blocks. Liam Ellis, Jason Phelps and Hanley all added 11 points for Clarkson. The Scarlet and Brown moved to 3-9 on the season and 1-4 in conference play, while Clarkson improved to 5-7 and 1-4. Up next, the Saints will continue conference play, hosting Ithaca and Union on January 12th and 13th, respectively. 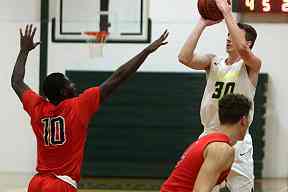 December 15: SUNY Oswego shot 55 percent from the arc and 51 percent from the floor to top the St. Lawrence University men's basketball team 100-63 in non-conference play Friday evening in Burkman Gymnasium. Ian Schupp went 6-for-9 from the arc and Brandan Gartland went 4-for-4, each recording 20 points for the Lakers. The Saints were led by first-year Pierre Coffy with 11 points, while classmate Cam Keeley added 10 points and five rebounds. Junior Ben Crawford added eight points and six rebounds for the Scarlet and Brown. SUNY Oswego sprinted out to a 30-8 lead over the Saints nearing the midway mark of the first half. St. Lawrence attempted to shrink the 22 point lead and managed to come within 11 points, with a layup from Crawford with just over three minutes in the half. Brandon Arnold went 2-for-2 from the line to narrow the Lakers' lead to just eight points. However, that was as close as the Saints would come for the remainder of the game. The Lakers continued to build their lead after the break, leading 67-45 with 14 minutes to play and 81-51 with just over eight minutes to play. 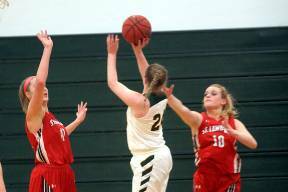 SUNY Oswego spanned St. Lawrence by 41 points with 1:28 to play. Three other members of the Lakers' squad added double digits as Jamir Ferebee tallied 14 points, while Tyler Pierre and Liam Sanborn recorded 13 and 11, respectively. The Saints held a slight 27-22 advantage in bench points. With the loss, the Saints fell to 2-6 on the season, while the Lakers improved to 5-4 overall. St. Lawrence will travel to Elmira tomorrow December 16th for a 4 p.m. matchup against the Soaring Eagles. November 13: Six players finished in double figures, led by senior Liam Ellis's 25, but the Clarkson University Men's Basketball team could not overcome three players with 20-plus points for Plattsburgh State as the Golden Knights dropped their season opener to the 14th-ranked Cardinals 105-95 Tuesday night at Alumni Gymnasium. The Golden Knights fell to 0-1 on the season and will head to Massachusetts this weekend for a pair of games at the Westfield State Tournament. Clarkson was not shy from the 3-point arc, making 16 3-pointers on 40 attempts, 20 coming in each half. Six different players hit at least one 3-pointer in the game for the Knights. Both teams struggled at the start with turnovers but once the nerves were shook neither team seemed to have much trouble pouring in points. After a 3-pointer from Jason Phelps made it 11-9, the Cardinals went on a 12-4 run in the next 2:35, capped off by a dunk from Brandon Johnson. The Cardinals extended the lead to 13 points at the 7:51 mark, but the Knights found a groove on offense and rattled off 18 points in just six minutes, pulling the Green and Gold to within four (40-36) after back-to-back 3-pointers from Ellis and Phelps. The Cardinals responded with a 3-pointer and another fastbreak dunk for Johnson to close out the half (45-36). The nine-point margin expanded slightly at the start of the second half, but a Roburt Welch 3-pointer and a jumper from Chris Hulbert drew the Knights to within four (62-58) with 11:12 remaining. That would be as close as Clarkson would get, however, as Plattsburgh took advantage of Clarkson's early second-half foul trouble with plenty of free throw opportunities. Nick DeAngelis hit a 3-pointer at 6:51 and a pair of free throws from Ian Howard at 6:19 gave Plattsburgh an 18-point lead, an advantage the Cardinals would eventually extend to 20 just a minute later. However, there would be no blowout, as Clarkson kept on hitting shots and made its way back to a 14-point deficit with 2:30 to go. Ellis hit a layup at 1:24 to get the Knights to within eight (96-88). Though Clarkson's need to foul was effective in getting the Knights back to striking distance, the team's top two scorers from a year ago (Ellis and Matt Higgins) fouled out, allowing the Cardinals to settle for a 10-point win despite the late run. Ellis finished with 25 points, shooting 9-for-10 from the floor, and added six assists and six rebounds. Matthew Hornak tossed in 16 points and freshman Chris Hulbert came off the bench to score 17 points in 19 minutes. Welch also contributed 12 points while Higgins and Phelps each scored 10. Reese Swedberg also grabbed nine boards for Clarkson. For Plattsburgh State, Johnson finished with 28 points and five assists while Jonathan Patron scored 27 points to go along with nine boards. DeAngelis came off the bench to score 23 points and Ian Howard added 10 rebounds and six points. November 11: Across the country, many teams are embracing the value of the 3-point field goal, but few did so with the volume and efficiency of the Clarkson University Men's Basketball team. That formula will be repeated in 2018-19, and with more shooters entering the fold the Golden Knights are eyeing a playoff spot and position among the conference's best teams. The only key loss from last year's Golden Knights' squad is senior Gary Hanley. The transfer played just a single season with Clarkson and filled a considerable void after the graduation of Derek Hart in 2017, serving a big role in terms of defense and rebounding. Clarkson brings back 11 players and four of its five starters from a year ago, putting the Green and Gold in position to reach the playoffs in 2019, a position they narrowly missed on a tie-breaker a year ago. Clarkson opens its season on Tuesday against Plattsburgh State, tipping off against the Cardinals at 7:00 pm at Alumni Gymnasium. Key Returners: It's not easy to return two conference all-stars in a league with 10 teams and just 15 spots or so for league standouts, but the Golden Knights have both of their Liberty League All-Stars back for 2018-19. Junior Matt Higgins, a Liberty League Second-Team All-Star, took one of the biggest leaps in program history from his freshman to sophomore season, going from 2.9 points per game in 2016-17 to 18.5 points per contest as a sophomore. Senior Liam Ellis, a Liberty League Honorable Mention All-Star, posted 15.0 ppg and led the conference with 4.5 assists per game, frequently locating Clarkson's talented shooters along the perimeter. The biggest returner for Clarkson, however, is one number rather than any one player: 265. That's how many 3-point field goals were made by returning players on Clarkson's 2018-19 roster. Higgins buried 76 3-pointers at a rate of 39.8%, but senior Matt Hornak (63, 40.9%), sophomore Joe Lucas (40, 40.8%), and sophomore Roburt Welch (20, 42.6%) each shot plenty of volume as well and at an even higher rate of success. Add in sophomore Jason Phelps (14, 37.8%), who was slowed by injury, and senior Malaquias Canery (12, 36.4%) and the Knights likely will not face many nights where they lack options. Senior Keenan Gayle is the team's top on-ball defender and often provides the opposition fits with his quick hands and athleticism. 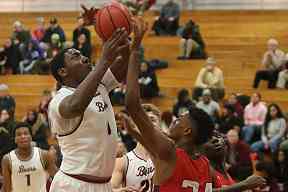 Junior Barryn Shark saw his playing time increase down the stretch and the point guard produced the two best assist totals in the league last year. Senior Cormac Bettinger has been slowed by injuries during his three seasons but will still provide a significant contribution and junior Jake Purdy could provide the team a much-needed rebounding presence off the bench. Key Newcomers: Fifth-year head coach Jeff Gorski is excited about the four freshmen that join the team in 2018-19 as each provides depth or fulfills a need. Reese Swedberg, a 6-7 forward, gives Clarkson an inside presence and fellow 6-6 forward Marques Bouyer also gives the Knights another big body in the paint. Andrew Kelly will give the Knights options at both guard and forward, while Chris Hulbert adds to Clarkson's already enviable stable of 3-point shooters. 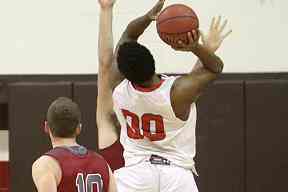 November 13: The SUNY Potsdam men's basketball team (1-0) opened their season with a 90-77 win over St. Lawrence University (0-1) on Tuesday night. The Bears were firing on all cylinders shooting 51.7 percent from the field, and all five starters scored in double-digits. 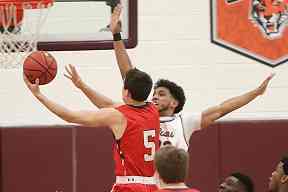 Senior guard Dante Langley (Schuylerville, N.Y./Schuylerville) finished with a game high 25 points and nine rebounds in the win. The Bears got off to a hot start in the opening minutes of the season. Immediately after a 3-pointer by Langley, senior forward Serigne Kane (Brooklyn, N.Y./Brooklyn Prep) got a steal off a St. Lawrence inbound pass and slammed home a dunk in transition. On the Saints end, they were able to match the energy by the Bears with their composure and ball movement. A block by sophomore center Christopher Jeffrey (Norwich, N.Y./Norwich) followed by a 3- pointer by senior guard Dom DeRegis (Jamesville, N.Y./Jamesville-DeWitt) helped spark the 17-6 run by the visitors. Both teams created opportunities for themselves in the paint with their driving and transition baskets. 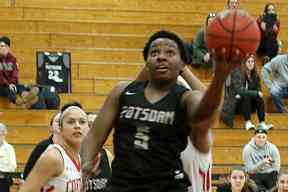 The 14 points by senior guard Nosa Onabor (Brooklyn, N.Y./Northside Charter) and 56 percent shooting from behind-the-arc was key for Potsdam's 43-37 first half lead. The 17 points and six rebounds by grad guard Riley Naclerio (Cohoes, N.Y./Albany Academy) kept St. Lawrence afloat in the back and forth 20 minutes of play. Potsdam carried on its aggressiveness in the painted area from the first half with five layups within the first four minutes. It allowed them to build lead to as much as 13 in the second half. 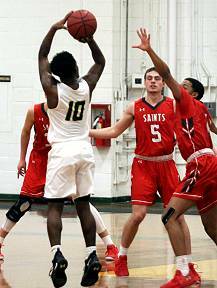 The Saints countered their attack with a 3-pointer by freshman guard Luke Hicks (Clifton Park, N.Y./Shenedehowa) followed by a steal and fast-break layup by guard Jordan Huntley (Washington, D.C./Kimball Union Acad.). Then, a layup by Hicks cut the lead to just four. Langley put a stop to the momentum by attacking the paint and dunking the ball at the 8:39 mark and then hitting his third 3-pointer of the night to push the lead back up to eight. The visitors would cut it down to six with 1:37 seconds left, but the Bears defense and missed free-throws down the stretch halted the comeback effort for St. Lawrence, as the Bears closed out the 90-77 win. Onabor left his mark on the game on both ends, scoring 16 points and finishing with four steals. Hicks finished with 21 points and Naclerio had 18 points, nine rebounds, and two blocks for St. Lawrence. The game was Potsdam's first victory over SLU since Dec. 4, 2012. Next, the Bears are headed to Worcester, Mass. for a meeting with Worcester Polytechnic Institute on Friday at 5:30 p.m. in the first round of the Ted Coughlin Tournament. 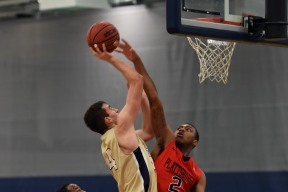 November 16: The SUNY Canton men's basketball team scored 45 points off the bench but No. 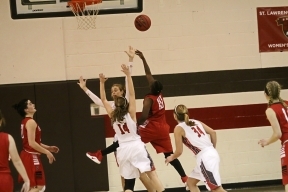 14 nationally-ranked Plattsburgh State earned an 87-71 win v. the Roos on Friday evening. Brandon Adkisson and George Nehma led the Roos with 12 points each, while combining to shoot 10-for-17 from the field. Jordan Stewart chipped in 10 points, while Quran DuBois posted eight points on 4-for-7 shooting. Plattsburgh State led by as many as 23 points in the opening half (37-14) behind 15 first-half points from Jonathan Patron. SUNY Canton's 11 first-half turnovers led to 18 points for the Cardinals. The Roos used a 11-0 run the first 4:39 out of half to get within 44-38 early in the second half. Plattsburgh responded with a 10-2 run to extend the game back to double digits and cruised to the 87-71 victory. Patron led all scorer with 23 points and added nine rebounds, while Chris Middleton finished with 20 points on 7-for-12 shooting. The Cardinals out rebounded the Roos 51-35 including 27-9 on the offensive glass. Plattsburgh tallied 40 points in the paint, 27 second-chance points and 27 points off turnovers, while the Roos received 45 points from their bench. 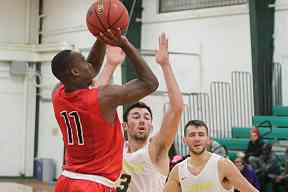 November 16: The 14th ranked Plattsburgh State men's basketball team (3-0) cruised past SUNY Canton (1-2) 87-71 Friday night inside the Stan Cohen Court. 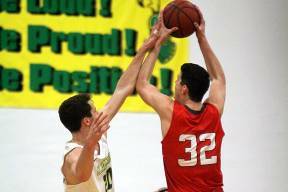 Senior forward Jonathan Patron (Huntington, N.Y. / Harborfields) led the Cardinals with 23 points and nine rebounds. Senior guard/forward Chris Middleton (New York, N.Y./Cardinal Hayes) scored 20 points and picked up six rebounds. Senior guard Brandon Johnson (Greenburgh, N.Y./Woodlands) recorded seven assists and nine points. Senior forward Isaiah Hill (Brooklyn, N.Y./HS for Dual Language and Asian Studies) had seven rebounds, four assists and two blocks. Canton had the lead two minutes in when Howard had a layup and Patron put in a layup and two jumpers to take a seven-point cushion. Two minutes later Johnson, Howard and junior forward Adam Jaquish (Moriah, N.Y./Moriah) all had layups to lead by 13. After two free throws from the Kangaroos, Hill had a good tip in followed by a three-pointer and layup from Johnson and a three-pointer by junior guard Jeremy Eisenman (New York, N.Y./NEST+m) for a 21-point advantage. Another three from Eisenman a few minutes later put the Cardinals up by 23 points. Canton was able to cut down the lead to 15 points as Plattsburgh State headed into halftime up 44-29. The Kangaroos came into the second half with more momentum recording 42 points compared to the Cardinals 43 and even came within four points of the lead five minutes in after an 11-point run. The Cardinals retaliated with a 19-point run. Patron started it with a layup, Howard had a tip in, Middleton drained two three's, Patron put in another layup, Middleton made two free throws, Johnson had a jumper, Middleton had a dunk and one. 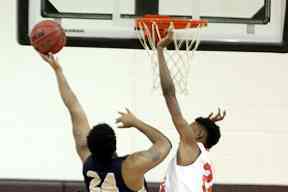 After a layup from Canton Middleton drained another three, sophomore guard Travis Cox (Brooklyn, N.Y. / Frederick Douglass Academy) had a layup and Middleton put in a layup for a 28-point edge. The Kangaroos were able to come within14 points of the lead but two free throws by freshmen guard Logan Galanes (Keene, NH / Keene) gave the Cardinals the 16-point win. 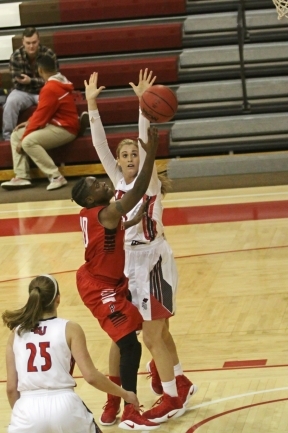 Plattsburgh State out-rebounded Canton 51-35 and recorded 27 points of Cantons 19 turnovers. The Cardinals are on the road Tuesday, Nov. 27, to play St. Lawrence at 8 p.m.
November 13: The Plattsburgh State men's basketball team opened up the 2018-19 season with a 105-95 win over Clarkson University Tuesday night in Alumni Gymnasium. Senior guard Brandon Johnson (Greenburgh, N.Y./Woodlands) led the Cardinals with 28 points and four assists, senior forward Jonathan Patron (Huntington, N.Y. / Harborfields) logged 27 points and junior guard Nick DeAngelis (West Milford, N.J./West Milford) came off the bench to score 23 points and went 7-for-7 from the free throw line. Senior forward Ian Howard (Queens, N.Y./Springfield Gardens) picked up 10 rebounds while Patron had nine and DeAngelis recorded five. Clarkson scored two baskets to start the game and Plattsurgh State went on a six-point run to take the lead. Patron put in a jumper, senior forward Isaiah Hill (Brooklyn, N.Y./HS for Dual Language and Asian Studies) had a layup and Patron put in another jumper. The Cardinals had a 13-point advantage with 7:51 left in the first half and Clarkson came within four points with 1:27 left. DeAngelis drained a three and Johnson dunked after Howard stole the ball with five seconds left to lead 45-36 at halftime. The second half proved to be more of a battle with Plattsburgh State only out-scoring Clarkson 60-59. Plattsburgh State started the second half with a jumper from senior guard/forward Chris Middleton (New York, N.Y./Cardinal Hayes), a layup from Johnson and two free throws by Patron to take a 15-point edge. 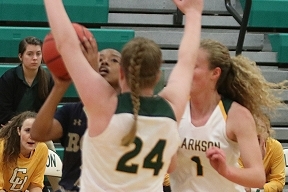 Clarkson came within four points of the lead halfway through the second half but a three-pointer from Patron and a layup by Johnson kept them afloat. The Cardinals took their largest lead of 20 points with five minute left in the game and Clarkson was able to come within seven points with 37 seconds left in the game. One free throw from Parton and two by Johnson at the end of the game sealed the Cardinals ten-point season opening win. Jan. 9: An overwhelming advantage on the glass for St. Lawrence limited second chances for the Clarkson University Women's Basketball team as the Golden Knights dropped a 73-57 decision against the Saints on Tuesday night at Alumni Gymnasium. The Golden Knights saw their record evened at 6-6 overall while moving to 1-4 in the Liberty League. St. Lawrence edged over .500 in conference at 3-2 and improved to 8-4 on the season. Senior Devin Sorell poured in a season-high 31 points, her fifth career 30-point game and first of 2017-18. Sorell shot 11-for-27 from the field and also added in four assists and three steals for the Knights. A solid shooting performance in the early going mitigated the size advantage possessed by St. Lawrence, as Clarkson rushed out to a 13-4 lead following Molly Stewart's 3-pointer from the wing at 4:15 in the first quarter. After Sorell sunk three consecutive free throws at the 2:12 mark, the Knights were up by 12, a lead that they would hold at the end of the quarter as well when Sorell hit a layup in the waning seconds. Things began to change course in the second quarter as St. Lawrence began to pound the ball inside. Even when the shots didn't fall for St. Lawrence, the Saints were able to get offensive rebounds for second chance opportunities. Jenny Scudder hit a 3-pointer at the 2:31 mark to pull St. Lawrence within two, and a pair of free throws from Annabella Pugliese with 27 seconds left in the quarter knotted the game up at 28-28 at the break. With several key Clarkson players in foul trouble in the third, St. Lawrence got things going in the paint, making 10 layups in that period alone. Sorell did her best to keep the Knights in the game, scoring 11 of Clarkson's 17 points in the quarter, but in the fourth quarter St. Lawrence stuck to its game plan, pounding the ball inside and simply outrebounding Clarkson at every turn. The Knights trailed by seven with eight minutes to go in the quarter, but the Saints started hitting short range jumpers in addition to their points from the block, slowly extending the advantage to double figures and finishing with a 16-point margin of victory. Sorell had a game-high 31 points for Clarkson and freshman Hannah Earl chipped in 10 points and eight rebounds in her best game of the season. The Saints were keyed by a 51-23 advantage on the glass, headlined by the double-double from Katie Frederick, who scored 13 points and grabbed 13 boards. Annabella Pugliese added 12 points and Meghan O'Connor produced 10 points and eight rebounds, including seven offensive boards. Meghan Hynes also tacked on 12 points for St. Lawrence. Jan. 6: Twenty straight points in a little over four minutes during the first quarter by the Clarkson University Women's Basketball team was all the cushion the Golden Knights would need as they cruised to a 79-41 Liberty League win over Bard College on Saturday afternoon. The Golden Knights picked up their first conference victory of the season and moved back above .500 overall, improving to 6-5 and 1-3. The Raptors remained winless at 0-10 and 0-4. Clarkson begins a seven-game home stretch on Tuesday when it takes on St. Lawrence University. With a season-high 27 points in the first quarter, Clarkson recovered from a tough loss against Vassar on Friday. The Golden Knights were up 7-4 midway through the first quarter, but a 20-0 run in 4:27 seconds that included four 3-pointers quickly provided Clarkson with ample breathing room for the remainder of the game. 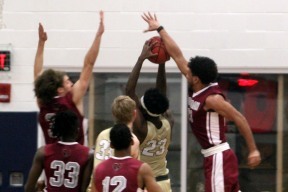 The Knights were particularly formidable on defense, forcing 16 turnovers in the first half and converting those chances with 21 points at the other end. Both Madison Shea and Devin Sorell scored 15 points in the first half. Bard shot just 2-for-23 in the first half, including 18 straight misses from the field over the last 16-plus minutes. After Clarkson extended its lead to as many as 42 points in the early moments of the second half, the Golden Knights' starters were pulled for the final 18 minutes of the game. Allowed an opportunity to show their merit, the bench players finished the game with 35 points overall. Shea finished with 15 points on 7-for-9 shooting in just 17 minutes, adding in 6 rebounds, 3 assists and 4 steals. Sorell also had 15 points, going 6-for-11 from the floor with three 3-pointers in 18 minutes, while also contributing 5 assists and 4 steals. Tricia Loso scored 11 points on 4-for-7 shooting in 18 minutes of reserve, while both Molly Stewart and Rachel Marion scored eight points each. Marion also had a team-best seven rebounds. For Bard, Katie Esposito had 13 points and 11 rebounds, while Sarah Morris was just shy of matching her teammate's double-double thanks to nine points and 10 boards. Jan. 9: First-year Katie Frederick recorded her third double-double of the season, shooting 6-for-10 from the field, and the St. Lawrence University women's basketball team overcame a first-quarter deficit to defeat Clarkson 73-57 in a Liberty League contest Tuesday evening in Potsdam, New York. Prior to tonight's game, St. Lawrence ranks ninth in the nation for scoring defense, only allowing 44.6 points per game. With the win, the Saints improved to 8-4 on the season and 3-2 in conference play, while Clarkson fell to 6-6 and 1-4. Second to Frederick, Annabella Pugliese and Meghan Hynes each added 12 points, while Meghan O'Connor scored 10. Marlee Gunn posted a team-high six assists and two steals. The Golden Knights outshot the Saints 23-11 in the first quarter, averaging 58 percent from the field and Devin Sorell accounting for 13 points of the teams' points. The Saints worked to make up ground in the second quarter holding Clarkson to just five points. Jenny Scudder landed a 3-pointer to bring the Saints within two with 2:31 remaining. Pugliese drew the late foul, went 2-for-2 from the line to tie the game at 28. The Scarlet and Brown went on an 11-point run to end the second frame with baskets from Katie Gallagher, O'Connor and Scudder. Both team's nearly battled point-for-point in the third frame, however the Saints held a slight four-point advantage with 5:20 to play. Cara Waterson netted back-to-back buckets to extend the Saints' lead to 50-43. O'Connor landed a jumper from just outside the paint to put the Scarlet and Brown up by nice with less than eight minutes to play in regulation. St. Lawrence held a 12-point lead after a jump shot from Pugliese with just under four minutes to play and capped its six-point run with a jumper from Kaelyn Kohlasch. Kohlasch then extended the Saints lead to 16 points with about two minutes remaining. "It was a really nice game for us tonight," said head coach Dan Roiger. "We had a really slow start, I think the team wanted to win so badly they weren't able to relax. Meanwhile, Clarkson was red hot and had a great start." "We had an awesome second half," Roiger continued. "We ran well, we passed well and we pounded the ball inside to our posts, who finished at the rim. Overall, it was a nice win and our team continues to learn about their strengths and what we do best." Sorell shot 11-for-27 from the floor and 2-for-7 from the arc to lead the Golden Knights with season-high 31 points, four assists and three steals. Hannah Earl added 10 points and a team-high eight rebounds, while Madison Shea rounded out the top three scorers with seven points. Jan. 6: Meghan Hynes led the Saints for the second day in a row with 14 points and first-year Marlee Gunn netted a season-high 13 points as the St. Lawrence University women's basketball team successfully completed their first undefeated conference weekend of the season, topping Vassar 55-47 on Saturday afternoon in Poughkeepsie, New York. Hynes and Gunn also combined for 10 rebounds, grabbing six and four, respectively. Kaelyn Kohlasch recorded nine points and eight rebounds, while Katie Frederick added eight points and three rebounds. Kohlasch also posted a team and season-high three steals. Both teams nearly battled point-for-point through the first five minutes of play. The Saints then quickly added a four-point run, followed up by another six points to take an 18-10 lead over the Brewers. Vassar ended the first quarter with a six-point run of its own, only trailing by two points after the first ten minutes. Julia Roellke quickly tied the game at 18 with a layup at the 9:28 mark of the second quarter. After three lead changes, Nicole Teta landed a 3-pointer to give the Brewers a 32-26 advantage. Vassar continued to hold the lead up until the break, with a 35-28 lead over the Scarlet and Brown at half time. The Saints outshot Vassar 15-2 in the third quarter to regain the lead and bring a six-point advantage into the final frame. Sophie Nick tallied the only basket for the Brewers in the third, while Frederick, Hynes, Jenny Scudder and Cara Waterson each picked up points for the Saints. The Brewers wouldn't go down without a fight, coming within two points with a 3-pointer from Nick with about six minutes to play. Kohlasch, who currently leads the Liberty League with .481 3-point shooting percentage and 2.5 3-pointers per game, responded with a 3-pointer of her own to put the Saints up by five with 4:46 to play. A late foul off Scudder, gave the Brewers the chance to make it a one-possession, but Vassar couldn't capitalize on the free throw and a series of free throws from Marlee Gunn down the stretch would seal the victory for the Saints. "This is a big win for us," said head coach Dan Roiger. "Vassar is a good, veteran team that has been seasoned by a tough schedule. For us to go on the road with our young squad and get a victory is a real credit to our perseverance and work ethic." "Our defense and rebounding were outstanding in the second half after a rough second quarter," Roiger continued. "Our players made some great adjustments at halftime and executed our game plan very well. Our whole team played well, but our posts really did a great job on some good players." Vassar was led by Samarah Cook and Roellke with nine points each, while Teta, Nick and Ariella Rosenthal each netted seven. Roellke finished with a team-high seven rebounds. Nick and Rosenthal each grabbed five. Cook and Roellke each added two steals for the Brewers. With the win, the Saints wrapped up their first 2-0 weekend in conference play and earned their first win over the Brewers since the 2015-16 season. After today's result, both teams move to 7-4 on the season and 2-2 in Liberty League play. November 16: Billie Rivenburgh and Tyberia Wallace combined for 13 points and 16 rebounds but the SUNY Canton women's basketball team dropped its season opener 49-33 to SUNY Cobleskill on Friday evening. Tyberia Wallace led the Roos with seven points and seven rebounds, while Billie Rivenburgh hauled down a team-high nine rebounds to go with six points on 3-for-7 shooting. Sade Rogers and Emily Pentz tallied five points apiece. Cobleskill held a 12-8 advantage after the opening quarter. The Roos tied the game at 15 following a Casandra Clarke old-fashioned three-point play with 3:59 left in the first half. The Fighting Tigers led 20-15 at intermission. The Tigers held advantages in fast break points (12-0), bench points (21-8) and points off turnovers (24-3). 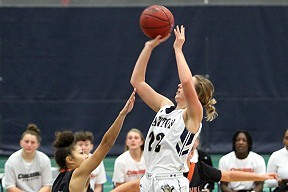 Both teams struggled shooting as the Roos hit just 23 percent of their shots, while Cobleskill knocked down 25 percent of its attempts and went 0-for-13 from three-point range. Addy Lawson paced the Tiger attack with a double-double on 18 points and 10 rebounds.The Roos host SUNY Potsdam on Sunday at 1 p.m. in the Roos House. 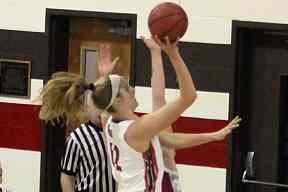 Nov. 17: The SUNY Potsdam women's basketball team (1-1) defeated SUNY Canton (0-1) 64-55 on Friday night in the first round of the Kevin Fee Roos Classic on Friday night. Junior guard Riley Luckie (Ogdensburg, N.Y./Ogdensburg Free Academy) led the Bears with 20 points, going three-for-three on 3-pointers. Sophomore guard Drew Dufrane (Liverpool, N.Y./Liverpool) shot 50 percent behind the arc, totaling 12 points. Potsdam's offense came out of the gate on fire, putting up a 22-point quarter to Canton's eight. Dufrane hit from beyond the arc twice during the 10-minute span with Luckie and freshman guard Mikayla Horton (Hammond, N.Y./Hammond) chipping in a three each. Freshman guard Alexis Davis (Brooklyn, N.Y./William H.S. Architecture & Design) scored six points and recorded two assists during the first. Canton kept the second quarter competitive, but was still outscored 13-11. Dufrane led second quarter scoring with six points, hitting a pair of threes. Freshman forward Nicole Hansen (Fulton, N.Y./G. Ray Bodley) put up three points, while Luckie and Horton added a bucket each. Canton trailed Potsdam 35-19 heading into half. The Bears put up 20 points to begin the second half, while Canton only managed 17. Luckie led Potsdam in the third by scoring 10, including a pair of threes. 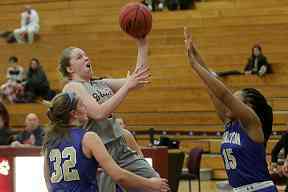 Horton hit another three for the Bears, while senior forward Emily Drake (Athens, N.Y./Coxsackie-Athens) and junior guard Abbey Smith(Bainbridge, N.Y./Bainbridge-Guilford) each scored a basket. The third concluded with freshman guard Carly Shear (Newark, N.Y./Newark) sinking her first collegiate bucket. Potsdam was outscored in the final quarter by a 19-9 margin, but were able to maintain the 64-55 victory. Freshman guard Mia Jackson (Bronx, N.Y./Mott Hall V) hit a jumpers in the fourth for the Bears, including a three that gave Potsdam a 24-point cushion. Luckie ended Potsdam's scoring with four consecutive free throws. Luckie added three assists and three rebounds to her 20-point night. Davis led the Bears with six boards with freshman forward Hannah Marcellus(Potsdam, N.Y./Madrid-Waddington) was right behind with five. 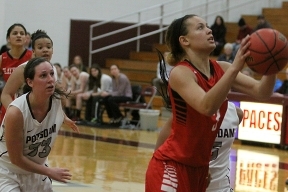 Horton and Smith each had two steals for Potsdam. Antanasia Chambers led Canton with 20 points and added four steals. Tatiana Laroche had nine points and four assists, while Randi Conway and Alauna Wright each put up eight points. Nov. 15: In the season opener, the SUNY Potsdam women's basketball team (0-1) fell to Utica College (1-0) with a score of 66-49. Junior guard Riley Luckie (Ogdensburg, N.Y./Ogdensburg) led the Bears with 11 points and a game-high five assists. Pioneer guard Ashelyne Babb totaled 17 points with seven rebounds. Babb hit from behind the arch to open the scoring, but Luckie answered with one of her own for the Bears. Utica's offense picked up at the 6:29 mark, by going on a 12-5 run to get out to a 15-8 lead at the end of the first quarter. Freshman guard Alexis Davis (Brooklyn, N.Y./Williamsburg H.S. Architecture & Design) hit a layup to get Potsdam within five, but the Pioneers' answered again for a 13-2 run that was capped with a 3-pointer from guard Kimberly Soriano. Potsdam battled back with back-to-back threes from junior guard Mikayla Horton(Hammond, N.Y./Hammond) and junior captain Abbey Smith (), respectively. Senior forward Emily Drake (Athens, N.Y./Coxsackie-Athens) added two points and Horton chipped in a free throw to bring the score to 32-21 in favor of Utica, going into halftime. The third quarter had the most scoring with 38 points between the teams. Scoring bounced back-and-forth throughout the 10 minutes of play with the Pioneers holding a 23-15 advantage. Luckie scored five of her 11 points during this time with forward Alaina Tripp hitting twice from behind the arch for six points to lead the Pioneers. The score was 55-36 going into the final quarter. Potsdam led the scoring in the fourth with the slight 13-11 scoring advantage including six points from sophomore guard Drew Dufrane (Liverpool, N.Y./Liverpool) and four from freshman forward Nicole Hansen (Fulton, N.Y./G. Ray Bodley). Junior forward Victoria Shopovick (White Plains, N.Y./Maria Regina) and freshman forward Hannah Marcellus (Potsdam, N.Y./Madrid-Waddington) each added two points. The Bears ran out of time before making up the deficit and Utica took the 66-49 win. Dufrane finished with eight points and a game-high five steals. Horton tacked on seven points in her Potsdam debut and a team-high six rebounds and two steals. For the Pioneers, Ashley Mayo tallied 12 points, while Tripp added 11 points, three steals and five rebounds. Jones led the Cardinals with 15 points, nine rebounds, five assists, a block and a steal. Clare netted a career-high 14 points and added four blocks in 15 minutes coming off the bench, which included an 8-of-12 mark from the line. Merkel notched a double-double with 12 points and a career-high 16 rebounds while adding four blocks. With three minutes and 15 seconds remaining in the game the St. Lawrence University women's basketball team held an eight point lead over SUNY Plattsburgh but the Cardinals scored 16 of the final 18 points of the game to escape with a 56-50 victory Tuesday night in a non-conference matchup in Burkman Gymnasium in Canton. Senior guard Jax Miller (Argyle, N.Y./Argyle) hit a go-ahead 3-pointer with 38 seconds remaining, leading the Plattsburgh State women's basketball team to a 56-50 victory over non-conference St. Lawrence University on Tuesday night at Burkman Gym. 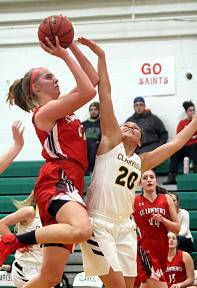 After freshman forward Taylor Clare (Peekskill, N.Y./Peekskill) tied the score at 38-all with 8:52 left in regulation, St. Lawrence went on an 8-0 run, and a 3-pointer by senior forward Caroline Dalton handed the Saints a 46-38 advantage. The two teams traded points until Clare made four free throws across two possessions to make it a four-point game. Sophomore guard Bella DePasquale (Ardsley, N.Y./Ardsley) drained a 3-pointer with 1:09 remaining in the fourth quarter, and following a 30-second Plattsburgh State timeout, the Cardinals forced a Saint turnover. That set the stage for Miller's heroics, as she converted on a 3-point attempt with just 38 seconds left to hand Plattsburgh State a 50-48 edge, its first lead of the fourth quarter. The Saints missed a layup with 19 seconds left, which then forced them to foul the rest of the contest. Senior guard Moe Jones (Freeport, N.Y./Freeport) went 4-of-4 from the line before Miller spelled the final score with a pair of made free throws with just two seconds left in regulation. Sarah Thomas and Caroline Dalton led the Saints (0-3) with nine points each and Dalton led the team with 11 rebounds. The Cardinals (2-2) had three players score in double figures with Monique Jones leading the team with 15 points. Both teams shot 25 percent from the floor, with the Cardinals going 17-of-68 and the Saints going 18-of-72. Plattsburgh State knocked down 18-of-27 attempts at the free-throw line to shoot 66.7 percent for the game, while the Cardinals held a 60-52 edge in rebounds. Nov. 19: Down by just two points with just six seconds remaining, the Plattsburgh State women's basketball team was dealt a crippling blow by an ill-timed turnover before the Cardinals saw a last-second three-ball by Stephanie Linder bounce off the iron in a 60-58 non-conference setback to Norwich University in Memorial Hall on Wednesday night. Outside of the final 6:22, the Cardinals (1-2) trailed the Cadets (2-1) just once – for a period of 1:22 in the first half to be exact. Neither team shot particularly well from the field, as the Cardinals (19-of-63, 30.2-percent) edged out the Cadets (18-of-60, 30-percent) in that category. In addition to losing the battle on the scoreboard, though, Plattsburgh State was out-rebounded by a 52-41 margin by their Vermont rivals. Of Norwich's final 13 points in the non-conference battle, all but three were scored from the charity stripe and each marker save four through that stretch was pumped in by the Cadets' Aliah Curry who finished with a game-high 23 points. Curry would open the scoring with a painted area jumper, but Brittany Marshall and Jax Miller banged back-to-back long balls to put a charge into the Plattsburgh State faithful and give the home squad a 6-2 lead 2:22 into things. Trouble reared its head early on for the Cardinals in the form of the official's whistle as junior post player Devona Paul was hit with a pair of personal fouls in the first 4:20 of the ballgame. Minutes later, sophomore Jessica Dolan received two citations for fouls which left Plattsburgh State with little choice but to try and formulate an effective game plan from outside the key to secure the win. It appeared as though the scheme was working when the Cardinals opened up a 15-8 edge with 7:41 remaining in the opening stanza. An 8-0 run which culminated with a mid-range splashdown from Jax Miller was all the offense Plattsburgh State could muster for 4:19, though. Their lead dwindling down to a mere two points after a Tory Kethro jumper and a three-point hit from Shyann Josler, the Cardinals called on Allie Taylor – who was making her first start at an NCAA institution – to right the ship. The junior out of Hannibal, N.Y., accounted for the next six points for Plattsburgh State and helped the home squad close out the half on a 9-6 surge. Heading into the last 20-minute period of the night, the Cardinals felt as though their luck had begun to change for the better. 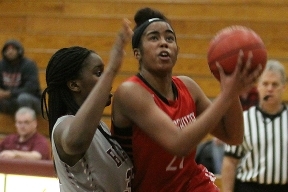 Although Kayla Mercer slung in five points for the Cadets, Plattsburgh State pushed right back and pushed its edge to eight points (34-26) on the strength of a downtown swish by Marshall. Norwich, though, continued to resist the Plattsburgh State scoring onslaught and trimmed the Cardinals' advantage to one on four occasions before the Cadets retook the lead for the first time since 13:05 in the first half. Mercer drilled a step-back three-pointer with 6:21 to go, setting up a frantic fight to the finish for both clubs. The vast majority of the action during the final stages of the game occurred from the foul stripe, but Plattsburgh State freshman Shawna Thornton plundered the rock from Curry and sunk a fast-break layup to knot things at 47-all as 5:45 shone on the clock. With that, though, Plattsburgh State found itself almost unable to buy a basket. The Cardinals finished the game with a 1-for-6 showing from the field and committed six turnovers in the closing minutes. Facing a 54-49 deficit with 2:36 to go, the Cardinals stormed back to take the lead by employing a 7-0 run which was cued by a Misha Green jumper in the paint. Green, a senior, put the finishing touches on the surge with a make at the free throw line to put the Cardinals up 56-54 with 46 ticks to go. Mercer, though, played the role of the hero for the Cadets on the ensuing possession. Her three-point attempt with 31 seconds remaining was right on target, and after a highly questionable turnover call by the officials on the next Plattsburgh State trip down the floor, Curry hit three free throws in the final 18 seconds to close things out. The Cardinals hit 16 of their 20 attempts at the charity stripe (80-percent), but were a woeful 4-of-22 (18.2-percent) from long range. Marshall recorded a team-high 15 points for the Cardinals while Taylor added 12. Linder put forth a well-rounded effort of nine points, seven rebounds, three steals and two assists in the loss. Mercer added 15 for the Cadets while Heather LeBlanc pulled down a game-high 15 rebounds. The road beckons to the Cardinals once again, but not before Plattsburgh State takes a basketball hiatus of nearly two weeks. On Tuesday, Dec. 2, the Cardinals will see how they stack up against Liberty League and North Country nemesis St. Lawrence University. Tip-off in Canton, N.Y., is scheduled for 6 p.m.
Nov. 16: Going toe-to-toe with its first of three top-25 opponents of the 2014-15 campaign, the Plattsburgh State women's basketball team traded blows with No. 15/17 ranked New York University before succumbing to a large second-half run by the Violets and dropping an 86-70 decision in the championship game of the NYU Tip-Off Tournament on Sunday afternoon at the Coles Sports Center. Doing all she could to help the Cardinals in their quest for a 2-0 start was senior Brittany Marshall who finished with a game-high 21 points on 8-of-13 shooting. As a team, the Cardinals shot the ball at a 40.3 percent (27-of-67) clip, but the depth and experience of the Violets eventually wore Plattsburgh State down. Instead of trying to force the issue down low against NYU's interior defenders, Plattsburgh State took up residence from beyond the three-point arc and thrived from there early on. The Violets netted the first two markers of the game, but Marshall and junior Stephanie Linder canned back-to-back long balls which gave Plattsburgh State a 6-2 lead just 2:07 into the non-conference fight. NYU managed to tie things up with a 4-0 burst, but fortunately for the Cardinals, Allie Taylor picked up right where she left off the previous afternoon and launched a 6-0 Plattsburgh State run with a layup. 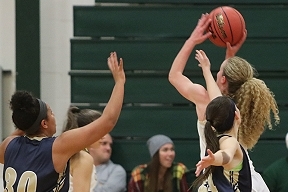 Marshall followed suit with one of her own before sophomore Jessica Dolan took a pinpoint pass from Taylor and connected on a fast-break jumper. With an upset bid fresh in their minds, the Cardinals kept the pedal to the metal. Taylor netted four more points before Devona Paul cleaned up a Dolan misfire and laid the ball in to put the Cardinals up 18-10. First-year player Shawna Thornton showed up with a three-point splashdown before sophomore Jax Miller pulled up from midrange and swished a jumper of her own. Miller's hit handed the Cardinals their largest lead of the game, 23-12, with 9:31 to go in the opening frame. Unbeknownst to the Cardinals, NYU was plotting a comeback and employed the first stages of its plan to regain the lead by using the three-point shot. Amy Harioka set up shop from downtown and knocked down consecutive trifectas to kick-start a 17-0 NYU run. The Cardinals couldn't keep up with the Violets during that stretch, going 0-fot-6 from the field and committing four turnovers. Emily Rowe sank a layup with 6:07 remaining in the first half which put NYU on top for good. Forced to watch as the Violets' edge grow to as many as six points, Plattsburgh State finally put a halt to the sizable scoring burst when Taylor took a trip to the charity stripe and knocked down a pair of attempts. Their offense finally coming around after a lengthy break, the Cardinals chipped away at the Violets' lead, eventually shrinking it all the way down to one when Thornton split a pair of free throws as the clock showed 1:31. That was as close as the Cardinals would come, though, as NYU pumped in five of the last six points in the opening stanza to take a 38-33 edge into the halftime break. Marshall represented two-thirds of the Cardinals total offensive output in the first 3:10 of the deciding frame. The Malone, N.Y., product rattled home a pair of mid-range jumpers to pull Plattsburgh State within one – 40-39 – for the final time. From there, the Violets seized control of matters by employing a 10-0 run which featured scores from a trio of players. Marshall and Paul combined for the next seven Plattsburgh State points to keep the Cardinals within shouting distance (54-46), but the balance and dominant interior game of the Violets continued to keep the visitors off-balance. A 46-24 edge in points in the paint belonged to the nationally-ranked home squad who increased its lead to as many as 19 by the time the final horn sounded. Megan Dawe amassed a team-high 19 points for the Violets to lead a quintet of NYU players who finished with 10 or more markers. Kaitlyn Read added a 13-point, 11-rebound double-double for the home squad who shot 47.7 percent (31-of-65) from the field including a scorching 17-of-28 (60.7 percent) mark in the final frame. Taylor finished with 14 points in another excellent outing for the Cardinals while Paul chipped in 11 and a team-best eight rebounds. St. Lawrence University at William Smith, ppd.